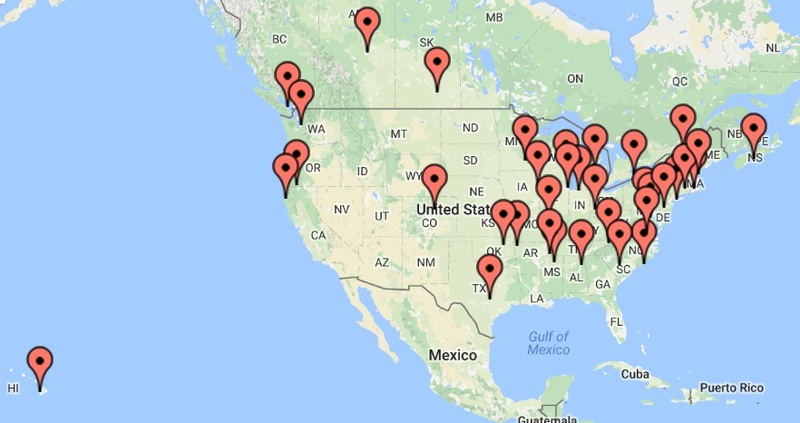 As reported previously in CPNN, Campaign Nonviolence planned more than 600 actions, events, marches and demonstrations in a diverse array of cities and towns in each of the 50 states. 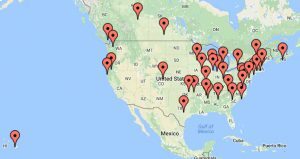 As of September 29, links to 65 reports of these actions in the USA were listed on their website. Following up their mobilization as well as a national conference for a World Beyond War, activists engaged in civil disobedience at the Pentagon. In order to obtain a general survey of events in the USA and Canada, we searched “Google News” for the week of 17-24 September by using the key phrases “International Day of Peace” or “Journée internationale de la paix.” For events elsewhere in the world click here. As seen on the map above, there were articles about events in 6 provinces of Canada and 30 states of the United States. Granby, Quebec Canada Peace marched with many faces when over a hundred Granby residents celebrated the International Day of Peace. “Granby is a host city for many immigrants from everywhere. We learn to live together with our differences. We have not all the same color or the same language, but the bottom line is that we learn to know ourselves, to live in peace and love, “said one of the organizers of the march, Brigitte de Souza. Halifax, Nova Scotia Organizers behind a daylong peace festival held in Halifax on Saturday say the recent gun violence in the city highlights the need for more people to find peace within themselves. Peace Halifax was a free event that featured guest speakers, yoga, art and meditation. The festivities focused on creating inner peace to try and make the world more peaceful. Niagara Falls, Ontario While the musical collective known as The Perpetual Peace Project is well known in the city, the Niagara Falls Public Library has started its own take. Organized by community development and program librarian Carrie Bosco in time for The International Day of Peace on Sept. 21, the Peace Project encourages visitors at all four branches — Victoria Avenue, Chippawa, Stamford and the MacBain Centre — to create origami peace doves. Regina, Saskatchewan People walking by Regina City Hall will notice a new, but recognizable symbol flying out front today. On Tuesday, the city raised a peace flag to mark United Nations International Day of Peace, also known as World Peace Day. PeaceQuest Regina — which was formed in Kingston, Ont. — made the request to fly the flag in front of city hall. It will stay there until Sept. 22. Nanaimo, British Columbia In the photo, Diane Bestwick, a member of Unity Church, carries the peace flag during a march along the Harbourfront Walkway at Maffeo Sutton Park as part of the Peace Party on Sunday. There was a multi-faith service, a peace march and ceremonies and entertainment to mark the International Day of Peace. Austin, Texas Students at Montessori schools in Austin and across the world are going to sing a song to honor the peaceful day. It is called “Light a Candle for Peace.” Mayor Steve Adler, Police Chief Art Acevedo, musician Jackie Venson, and local teen poet Sabeen Noorani will celebrate Peace Day at a conference that will start at 10 a.m. in front of Austin City Hall. Philadelphia, Pennsylvania Lisa Parker, of Strafford, started Peace Day Philly in 2010, and it’s grown every year since, becoming a nonprofit in 2013. In the last two years more than 3,500 people took part in PDP. Peace Day Philly events are planned from Sept. 18 to 24, including yoga, meditation, an international-themed festival, an interfaith dialogue, photos by Syrian refuge youth, a film, a concert and the Annual Sing Along for Peace. Peace Day Philly collaborates with some 30 organizations, with some separate events promoted under the Peace Day Philly umbrella, she said. St Louis, Missouri Students at St. Louis Job Corps Center partnered with students at Harris-Stowe State University to organize a peace walk through the city in celebration of the International Day of Peace. The walk ended in Forest Park where a rally was held. Many residents who participated say they are concerned about the violence around the world and right here in St. Louis. So far, the City of St. Louis police department has investigated 145 murders this year alone. Participates shared their personal stories, dedicated to preventing and reducing violence from Afghanistan to the United States. Dayton, Ohio Students from the Dayton Job Corps Center hosted a peace walk this morning to celebrate International Day of Peace. The walk was part of the national Job Corps student-led anti-violence initiative Youth 2 Youth: Partners 4 Peace The walk coincided with the Y2Y mission to promote anti-violence initiatives both on- and off-center. Students started Youth 2 Youth, or Y2Y, with three basic aims: to talk about violence and aggression in their communities, to empower one another to prevent violence and aggression, and to share their stories and talk about solutions, according to a release. Founded in the spring of 2015, Y2Y is a violence-prevention initiative created by and led by Job Corps students nationwide. South Berwick, Maine The wind cooperated and animated the 390 pinwheels set out in front of Central School Wednesday afternoon. It was the school’s way of celebrating International Day of Peace. “Pinwheels for Peace” was organized by art teacher Brenda Stewart and librarian Michelle Jones. After brainstorming, students wrote a message of peace on one side of a piece of paper and created an art piece on the other side. Their creations were then folded into pinwheels and mounted on sticks. As you plant them, think of peace,” teacher Barbara Childress told her students. Samoa, California On Wednesday, the Redwood Coast Montessori School held a day of celebration in honor of the United Nations International Day of Peace. It was a day to educate students on the importance of world peace. There was a multitude of events held starting with a parade. Students sang songs about peace, as they walked around the school track. They were holding a large paper dove, which was a representation of peace. Veterans and representatives from the Humboldt Chapter of the Women’s International League for Peace and Freedom came to join in on the fun. Tulsa, Oklahoma The students and staff of Tulsa Community College are rallying around the word “peace.” TCC hosted its annual International Day of Peace, but for the TCC community the day couldn’t have come at a better time. “To know that was a classmate amongst us was devastating,” student Nicole Lueker said. Terence Crutcher, 40, was a student at TCC. He told staff he was dedicated to completing his degree and becoming more successful. His dream was cut short five days ago when Crutcher was shot and killed by Tulsa Police Officer Betty Shelby. The circumstances are still under investigation. “It is very emotional because someone had to lose their life over that,” said Brittany Nunley, a member of the African American Student Association. Washington, D.C. In honor of the United Nations’ International Day of Peace, AU alumni Amanda Brenner and Amanda Molina will host a 24 hour nonviolence kickoff event on campus to benefit D.C. middle and high school students on Sept. 21. The event is targeted at empowering and educating youth from other D.C. wards with lower economic incomes that are racially segregated. Over 400 middle and high school students from the D.C. Public School system are expected to be bussed to AU, and others will arrive on their own, according to Brenner. The event will have a schedule of speakers, information booths and food. Denver, Colorado The University of Denver will celebrate International Day of Peace this Wednesday with a variety of events themed around “Many Stories, One DU.” The event is being hosted by the division of Campus Life and Inclusive Excellence. While DU has recognized the International Day of Peace in the past, this is the first year the observance has been aligned with so many events on a larger scale, says University Chaplain Gary Brower, who organized the event. After the shooting at the Pulse Nightclub in Orlando in June and other shootings that took place this past summer, Brower proposed the larger-scale observance as a way to bring awareness and knowledge to the importance of peace. Fayetteville, Arkansas Panel made up of six speakers launched the UA celebration of the United Nations International Day of Peace. The panel speakers included speakers of a religious background like, a professor of Tibetan Buddhist philosophy, a Rabbi at Temple Shalom and the faculty advisor of the registered student organization Al-Islam. There were also speakers representing different ethnic backgrounds, such as an author and Holocaust survivor, an educator for the Black History Education Program, and the field director for the nonprofit Arkansas United Community Coalition. Panel members first shared their outlook on nonviolence in regards to their personal experiences. Chicago, Illinois Maddi Jane and Jasmine Babers from the Chicago area were among several “influencers” who UN Assistant Secretary-General Ray Chambers tapped for the job getting the International Day of Peace message out in the Chicago area. The pair launched a Change.org petition for people to pledge 24 hours of non-violence on Wednesday and posted a video encouraging Chicagoans to share images of peace signs they’ve drawn on their hands on social media with the hashtags #HugForPeace, #PeaceDayChallenge and #WagePeace. Notre Dame, Indiana On Tuesday, several Saint Mary’s students and faculty participated in activities celebrating the International Day of Peace. Campus minister Emily Sipos-Butler said the Day of Peace is a way to commemorate and strengthen acts of peace and nonviolence within the community. Kealakekua, Hawaii For some students of Konawaena High School, the International Peace Day event Wednesday afternoon was much more than a conceptual celebration. The reason to hold the event was simple enough for Maianna Taylor, who served as one of the MCs and organizers. “What better way to invest your time than in something that celebrates peace?” she asked. “I’m calling it one of the darkest summers we’ve ever had,” she said, as this was a summer of the shooting in Orlando and other violence across the nation.The event included free food, art projects and decorating tiles for the 1001 Cranes mural. The tiles will be added to over the years, Obregon said, until the entire roof and upper walls of the entry hallway are covered. Gadsden, Alabama “One week, one message, one goal.” As soon as the words left the mouth of Gadsden Job Corps Center Director Juvenel Levros, they were taken up as a cheer from students attending the Youth 2 Youth: Partners 4 Peace rally at the Carver Community Center on Wednesday. More than 250 students marched from the Job Corps center on Valley Street down Tuscaloosa Avenue to the Carver Community Center as part of a violence prevention initiative created and led by Job Corps students nationwide. The march and rally coincided with the International Day of Peace, which was recognized around the world Wednesday. Midland, Michigan Creative 360 in Midland will host an International Day of Peace Family Celebration from 1-4 p.m. on Sunday. The program is open to the public and begins with the Jubileaus Hand Bell Ensemble from Trinity Lutheran Church, which will play a number of songs related to peace. A presentation about the myths and realities of life in Palestine will follow. Children and their families will enjoy decorating peace poles, creating beaded peace bracelets, folding origami peace cranes and helping create mosaic garden art for Creative 360’s wellness pathway The day’s activities will be punctuated with the reading of both original and well-known peace poems. Bobbi Lucas will close the event by leading a Planetary Peace Dance. Northfield, Minnesota Northfield held its 14th annual International Day of Peace Celebration Tuesday at Carleton College’s Great Hall, handing out its first-ever Arts Peace Awards. Organizers Judith Stoutland and Mar Valdecantos recognized the efforts of children who submitted a drawing, poem or photograph for the newly established award to involve more youth input. Wilmington, North Carolina It’s the International Day of Peace, and one local organization is working to spread the love here in Wilmington. The Grandmothers of Peace organization held a local event today at Hugh MacRae park. More than dozen people joined together for this 10th annual event. Organizer Lynn Heritage says in light of recent violence in our country and across our state, today is even more important. Supporters listened to music, played the tambourine, belly danced and spoke out about peace. Boonsboro, Maryland During a Sunday feast to mark this week’s International Day of Peace, the way to harmony was examined through various routes, including reaching out to others and meditation. Organizers wanted a meal that included the traditions of India, Iran, Italy and other countries. The entrees included naan, vegetable samosa and Persian rice. The feast was organized by the Interfaith Coalition of Washington County, which promotes an understanding of various world traditions. It is hoped that through that understanding, a deeper sense of peace will arise, said Sandy Boyer, who was among those attended. Ashland, Oregon The Ashland Culture of Peace Commission held a concert to finish up its ten days of peace activities since Sept. 11. For the last ten days, a vigil has been held in the Ashland Plaza and talks covering different topics have been held in the afternoon. “This really is a time to contemplate how we have evolved from such aggression and such trouble in the world to being more aware and more conscious,” Ashland Culture of Peace Commission executive director David Wick said. “More, ‘How do we come together to find pathways into greater well-being? '” The event included music, speakers and food. Freeport, New York In honor of International Day of Peace and Non-Violence Day, the Freeport Public School District’s annual Peace Concert and Art Exhibit will be held at the Freeport High School Performing Arts Center. The evening will showcase the outstanding musical and artistic talents of students from each of the eight Freeport public schools. Jonesborough, Tennessee To mark the International Day of Peace, the United Religions Initiative is holding a candle lighting gathering on the steps of the old Washington County Courthouse in downtown Jonesborough at 7 p.m. Representatives from local Jewish, Catholic, Protestant, Buddhist, and Muslim congregations will speak at the event. Prayers for peace from these diverse religions will be featured, along with the singing of songs together, and readings of the UN and Sister Cities proclamations. Providence, Rhode Island It might not feel like a world at peace. All the more reason, says Ginny Fox, to celebrate the peacemakers among us, and the good things that are happening in Rhode Island and around the world. “There’s so much negativity in our world. This is a positive event,” she said. Fox is executive director of the Peace Flag Project, which is holding its annual Peace Fest RI from 1 to 4 p.m. Saturday at Burnside Park in downtown Providence. The Peace Fest will include activities such as making peace flags, pinwheels, and face painting. There will be exhibits from a wide variety of Rhode Island nonprofits.